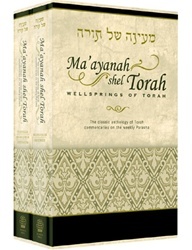 Countless anthologies of commentaries and midrashim on the weekly sidrah have been published through the centuries, but few have won the love and affection of the Jewish people as has the anthology Der Torah Kval, known more famously by its Hebrew title, Ma’ayanah shel Torah, or Wellsprings of Torah. Originally published in Yiddish in 1937, Ma’ayanah shel Torah was compiled by Rabbi Alexander Zusia Friedman, a remarkable man with an encyclopedic knowledge of hundreds of Rabbinic commentaries and chassidic sayings pertaining to the Torah and the haftaros. Rabbi Friedman was endowed not only with a rare understanding of the deeper meaning of Torah but also with the gift of discernment that enabled him to select those gems of Rabbinic and chassidic lore that would most appeal to the Jewish reader, regardless of his level of scholarship. When it was first published, Ma’ayanah shel Torah found immediate acclaim in Jewish communities throughout Europe. That popularity has not waned with the passing decades. Ma’ayanah shel Torah is famous for its ability to offer its readers "a quick vort"—a sharp and pertinent insight that is always thought-provoking and inspiring. This new English edition carries on that legacy. 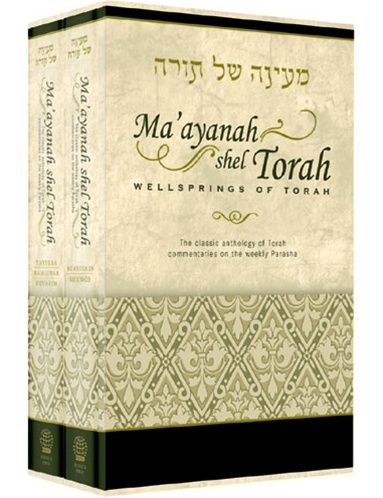 In addition to all the wonderful divrei Torah, this edition includes a bibliography of the numerous sefarim and brief biographies of the many Torah personalities from whom Rabbi Friedman quotes.